For the past 10 weeks, these students have completed a series of lessons on character, all of which can stem from military life. These include bullying, honesty, responsibility, and dealing with family separation. 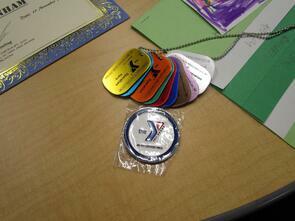 They’ve also received homework assistance and participated in team-building activities. To mark their completion of the program, each student was presented with a certificate, military coin and a set of dog tags, which feature each of the character lessons. After they were handed their certificates, we then, of course, celebrated with pizza… because what is any good celebration without it?! We would be remiss talking about this graduating class if we didn’t acknowledge the dedication and commitment from several members of 2nd Battalion, 4th Field Artillery Regiment on Fort Sill. These soldiers have given their time to these students every week since week 3 of the program. 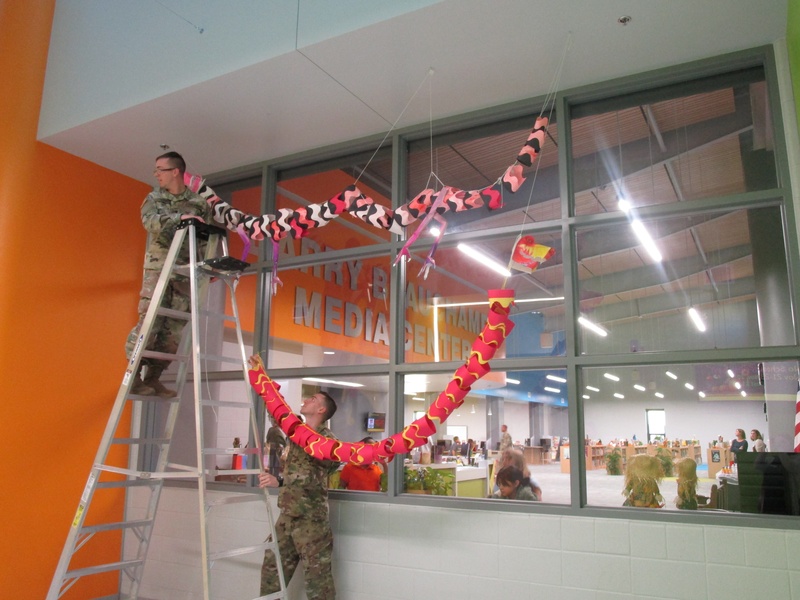 They’ve led them through various PT exercises, art projects – including making a 30-foot paper dragon that now hangs inside Freedom Elementary School! – and aiding with the lessons. Secondly, we’d like to thank Ms. Shanklin and the entire staff at Freedom Elementary School, for allowing us to take over their library space for the past 10 weeks. Having a designated area for the program was extremely beneficial to the safety and well-being of our students. Thirdly, to Corvias Military Living, which is where Operation Hero was originally housed. We sincerely thank them for their time, offer and commitment. Finally, we want to give a HUGE thank you to David Duncan and Angelica Gradick for leading Operation Hero this Fall. Launching a new program always comes with its fair share of hiccups and challenges. They have been incredibly flexible and helpful, ensuring the program ran as efficiently as possible each week. We are so proud of the success of Operation Hero and of our Fall graduates! And this graduating class is just the beginning..... Registration for our Spring session of Operation Hero (launching this January) is now open. Click HERE to read more.